Pink has become the popular signature of the new “girlie girl” culture, but rarely appears on the labels of serious wines, being confined to rosés, Champagne, and gimmicky wines like Hello Kitty. 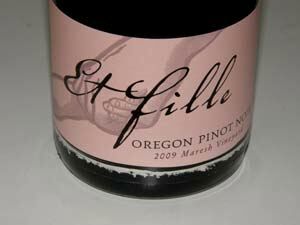 The pink labels on Et Fille wines, however, are very stylish, and make sense given the father-daughter collaboration that forms the foundation of this winery. I happen to find the labels to be very classy. The Mozeico family is quietly turning out some of Oregon’s finest Pinot Noirs. Father Howard, whose background is in software, has been making Pinot Noir since 1984. Daughter Jessica first assisted him with his winemaking efforts in 2000 and the name Et Fille was hatched. “Et Fille” (“ A Fee”) means “and daughter” in French. Howard jokes, “Mozeico et Fille” just wouldn’t work. It made sense to design a pink-themed label, since the winery incorporated a daughter into the team. The goal at Et Fille is to craft small lots of distinctive single-vineyard Pinot Noir in a style suited to the character of each individual vineyard’s terroir. No attempt is made to produce every vineyard-designated Pinot Noir in the same fashion. Father and daughter feel strongly that each vineyard has a unique voice, and they wish to preserve this precious expression of terroir in their artisan Pinot Noirs. 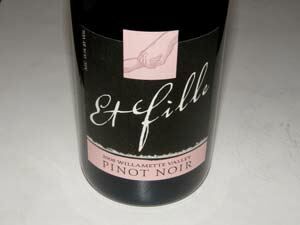 A superb Willamette Valley blend Pinot Noir is produced as well and is one of Oregon’s finest each year. The wines reviewed below were made to seduce with harmony and silky textures. All the wines are well-crafted with intense flavors at relatively low alcohols and offer well-balanced acidity. Choosing one as a favorite is really a matter of personal taste. Except for the Willamette Valley blend, all the wines will benefit from further cellaring. The prices are very reasonable considering the quality. These are not girlie-girl wines! 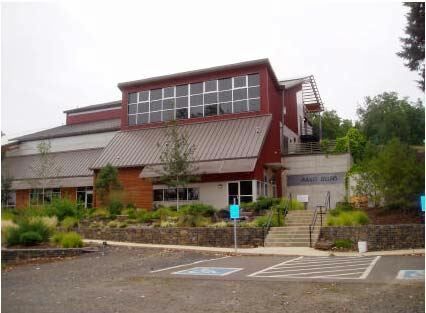 Et Fille wines are produced at August Cellars, a state-of-the-art gravity flow winery in Sherwood, Oregon, that is shared by several small wineries. A tasting room here offers some of the Et Fille Wines but an appointment is needed for an extensive tasting (503-449-5030). The wines are sold through a mailing list and are available for purchase on the website (www.etfille.com). Magnums are available. 14.3% alc., 220 cases, $38. Aged 10 months in 33% new French oak barrels. · Subdued, primary aromas of spice, violets, cut flowers and mint. Some very alluring dark red cherry and berry fruit peeks out showing impressive grip, focus and length. Still helter-skelter with fine-grain tannins to the front. All silk and satin on the palate. Like a new Louis Vuitton purse: you need to break it in before showing it off. Will come around sooner than the 2008s, but needs another year or two. Excellent the next day from a previously opened and re-corked bottle. Very good. 13.8% alc., 103 cases, $42. Pommard clone. Aged 10 months in French oak barrels. · Moderately light reddish-purple hue in the glass. Demure, but pleasing perfume of red and black berries, with hints of smoky oak and tobacco. A young, but sophisticated wine, with a stunning array of black cherry, red currant, and red plum flavors robed in immature tannins. The pedigree of the fruit is obvious. Still showing some unintegrated oak. A powerhouse that is impenetrable and not ready for prime time. Like a new pair of Christian Louboutin shoes: able to attract plenty of attention. 13.1% alc., 931 cases, $24. A blend of seven vineyards. · This wine has really blossomed since I tasted it last year. Demure red and black berry medley on the nose echoed on the palate. Medium-bodied and discreetly lush, the dark red berry flavors are wrapped in gossamer tannins and set off by bright acidity. The texture is particularly alluring: all silk and satin. Drinking perfectly now and one of the best 2008 Willamette Valley blends you will find in the marketplace. Very good. 13.7% alc., 172 cases, $34. From the well-known Nicholas Vineyard farmed by Nick and Sheila Nicholas. Pommard clone. Aged 10 months in 31% new French oak barrels. · Moderate reddish-purple color in the glass. Beefy, husky and dark-fruited on the nose. Thick, broad flavors of blueberries, black cherries, black raspberries and dark plums. Tremendous concentration and grip, but retains an attractive feminine tone. Perfectly balanced with a soft but ruffled texture in a worn leather jacket sort of way. Impressive finishing persistence. Even better two days later from a previously opened and re-corked bottle, indicating this wine will be an ideal cellar candidate. Everything you want and some things you didn’t think to ask for in an Oregon Pinot at the right price. 13.3% alc., $38. Pommard and Wädenswil clones. · The nose is currently closed for business but the flavors say Wow! Mouth coating core of strawberry and black cherry fruit makes you sit up to attention, keeping you interested through the soft, intensely fruity and refreshing finish. Showing very little leg now, and only hinting at its future greatness. 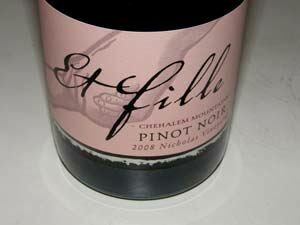 Note: some of the Oregon 2008 Pinots are closing up now and this is a perfect example. Cellar this wine for a few years and then enjoy over the next five to ten years. Very good (+). 13.0% alc., 149 cases, $42. Inaugural single-vineyard Pinot Noir from this site. The vineyard is owned by Mike and Patty Green. Wädenswil, 113 and 114. Aged 10 months in 33% new French oak barrels. · A distinctive wine that reflects its Yamhill-Carlton roots. The nose is a challenge to describe but a pleasure to experience with aromas of exotically spiced stone fruits, fig, fruit bin and a hint of pine. Intensely flavored and big-boned dark fruit with undertones of earth and cola, yet silky and light on its feet with a huge, supple finish. Generous tannins should soften over time, but this will always be a tannic wine. Pair with protein like some rare prime rib. This wine is like a tatted biker girl: rugged but very appealing in black leather. Cellar this one. Very good.